The Iran-Pakistan-Afghanistan triangle figured prominently in India’s foreign policy compass over the weekend. Three significant developments overlapped – the murderous attack on two prisoners in Pakistani and Indian jails with one dead and another critically wounded, Washington’s announcement of former diplomat James Dobbins as the United States special representative for Afghanistan and Pakistan and the eruption of border clashes on the Durand Line. It was against this complex backdrop that External Affairs Minister Salman Khurshid set out from Delhi on Friday on his visit to Tehran. In geopolitical terms, Pakistan’s tensions with India and Pakistan hogged attention, but Dobbins’s appointment introduces an intriguing element insofar as he is a staunch believer in the US-led war in Afghanistan and he is appearing at a point when the war is being wound up. Khurshid’s talks in Tehran may seem an act of “strategic defiance” of the US, eroding the robust American campaign to “isolate” Iran, but on closer examination, the India-Iran tango need not worry Washington. Khurshid’s talks had two main outcomes – potential Indian investment of $100 million dollar to develop Chahbahar port and Iran’s invitation to Indian companies to invest in production sharing oil exploration. The connectivity that India hopes to develop with Central Asia via Chahbahar and the parallel proposal to negotiate a trilateral India-Iran-Afghanistan transit agreement would help the stabilisation of Afghanistan, which is also a key objective for Washington strategists. There are seamless possibilities for India-Iran cooperation with regard to the post-2014 Afghan scenario, but then, Iran relentlessly opposes the American military presence in Afghanistan while India views the US presence in positive terms. On the other hand, the recrudescence of Pakistani-Afghan tensions strengthens the raison d’etre of the new Silk Road via Iran. India is unlikely to pursue a ‘strategic defiance’ of the US regional policy with regard to relations with Iran. India took a “principled position” that it will only abide by the UN sanctions against Iran but the ground reality is that the US’ sanctions regime whittled down Indian imports of Iranian oil by 26% last year and an uneasy “truce” prevails whereby India maintains it still imports Iranian oil, while Washington claims satisfaction that Tehran’s Indian earnings have been substantially reduced and sees no reason to “blacklist” Indian companies. Meanwhile, Delhi uses the “Iran card” to leverage the pending decision in Washington to relax export controls on LNG supplies to India. India’s argument is persuasive: How could Washington hurt India’s energy security by blocking oil imports from Iran while also disallowing LNG exports to India? Khurshid has visited Tehran just ahead of the India-US Strategic Dialogue slated for next month and this is indeed perfect timing. 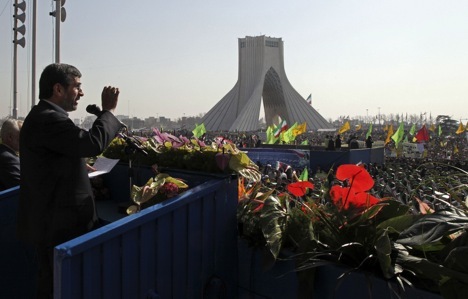 The Iranians see the urgency of injecting some “additionality” into the economic ties with India. Hence the oil offer, which of course signifies a major departure from Tehran’s traditional policy to restrict foreign oil companies to service contracts at a fixed fee. Tehran probably hopes this will be seen as a hugely attractive offer by Delhi, underscoring the geopolitical reality that Iran is an indispensable partner for India, the prospects of LNG supplies from the US notwithstanding. Clearly, Iran is bending over backward to promote Indian investments in its economy and to explore the possibilities of investing its surplus rupee funds (out of export of oil) in the Indian economy. But the Iranian efforts cannot make headway unless Delhi shares the same degree of commitment to build the partnership and encourages the Indian corporate sector, which is otherwise petrified about American wrath. So far Delhi has maintained an attitude of “masterly inactivity” – neither stymying the Iranian overtures nor pursuing them keenly enough – with an eye warily cast on Washington. The heart of the matter is that the US is the elephant in the Indian-Iranian tent and although Tehran doesn’t care about its presence, Delhi is acutely conscious of it. Besides, an added factor lately is that Riyadh also disfavors the Indian-Iranian strategic axis and it so happens that India has so pots boiling in the Saudi kitchen as well. All said, it is too early to say Khurshid’s visit to Iran signifies new Indian thinking.